Did you try your boots on in haste and now they’re taking a lot of wearing in—and still aren’t comfortable? Are your boots getting old and you’re thinking about buying a new pair, but want some fitting advice? So, how should boots fit? Read on to find out. It can be a challenge to find the perfect boots for your feet. Even different styles from the same manufacturer can vary in size. 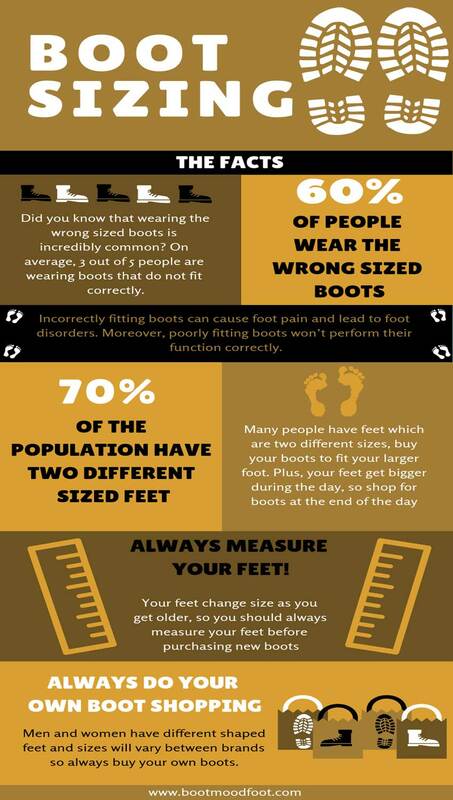 Did you know that up to 60 percent of the population wear incorrectly sized footwear? 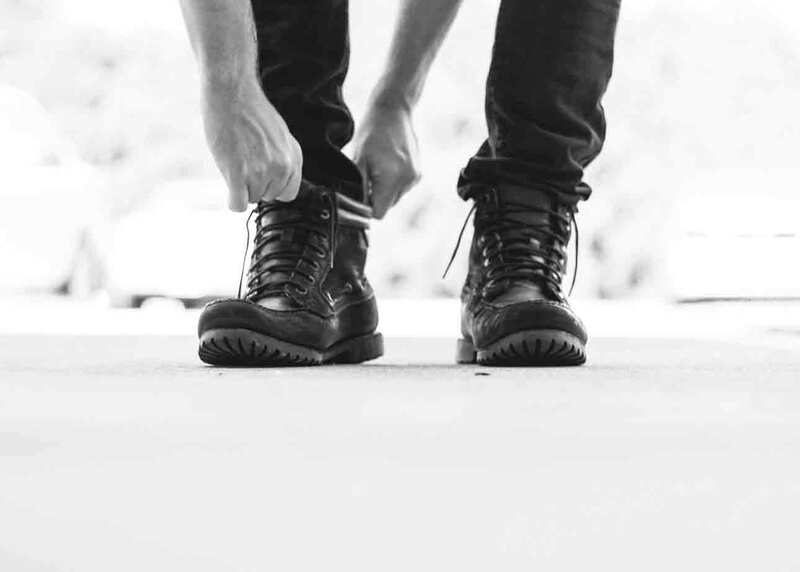 We’ll look at how to fit your boots and how to measure your feet, as well as giving you some hints and tips to ensure your new boots are a good fit. Boots come in many different styles. There are pull on, lace-up, snow style boots, and protective toe capped boots. Each can have its own fitting challenges. 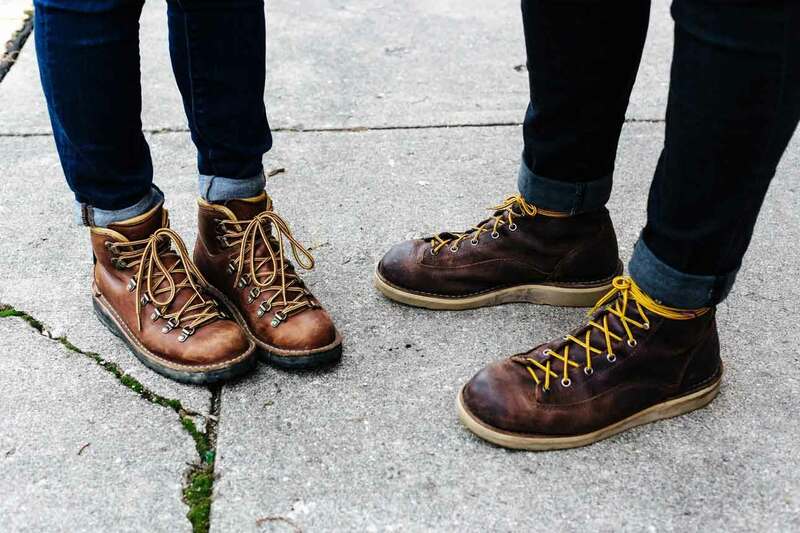 Styles like work boots and hiking boots are generally secured with laces. 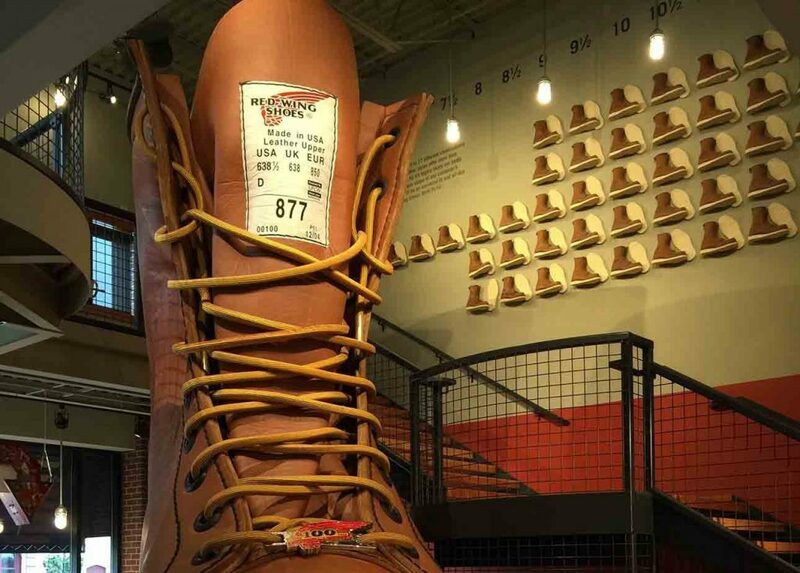 You can read our in-depth guide for fitting work boots here, or look here for hiking boots fit and sizing. If the boot has an insole which can be removed, take it out of the boot and stand on it. You should have space approximately the width of your thumb from the end of your longest toe to the end of the insole. The insole should also enclose your heel and the ball of your foot shouldn’t hang over the sides. 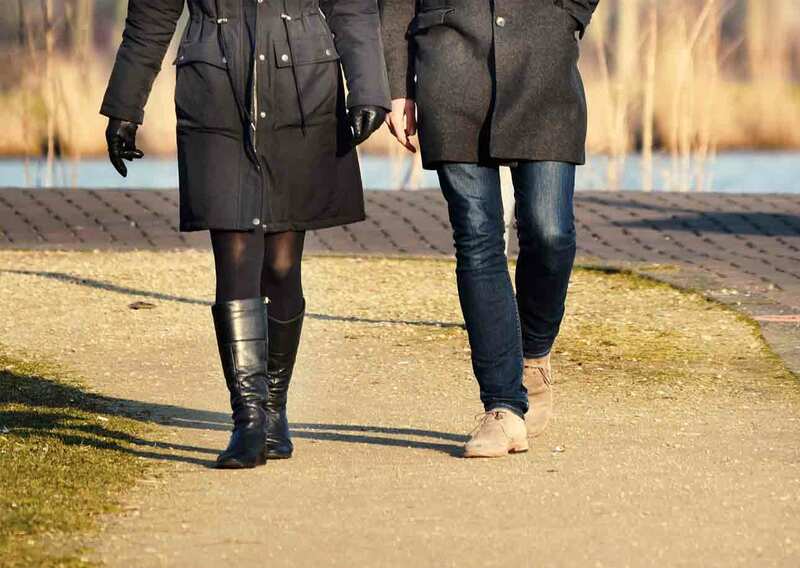 Try on boots near the end of the day; your feet swell as the day progresses. If they fit you in the morning they may end up being too small in the long run. Take along any insoles or orthotics you wear. It’s important to have these in your boots when you’re trying them, as they change the amount of room you have inside the boots. These might be custom-made, podiatrist-created insoles, or ones you buy off the shelf, like Superfeet Green Insoles or Timberland Pro Insoles. Wear socks that you would generally have on when you’re wearing boots. The thickness of a pair of socks affects the fit of the boots. Once you have selected your boots and tried them on, put them through their paces. Go for a walk around the store to make sure your toes are not cramped and your heels are not slipping. You shouldn’t feel your toes hitting the end of your boots. They should have some wiggle room. You shouldn’t feel any bumps or seams inside the boots which can rub. Your heels should be seated securely inside your lace-up boots and shouldn’t slip. Your foot should not feel pinched at the ball of the foot (the widest part). If they do, consider a wider style or size. Make sure your ankles won’t twist, by rolling your feet onto their sides. After putting your potential purchase through their paces and removed them, take your socks off. Check your feet to see if there are any red marks on your skin. If there are, it means there are points exerting pressure, which could result in corns or blisters down the line. There are ways you can lace up boots to ensure a better fit. You can take the pressure off the toes, middle of the foot, or calves by skipping eyelets. You can lace them tighter at the instep to hold your heel in place. This video shows you different ways of lacing boots. Pull on boots don’t allow for the same adjustments as lace up ones, so need to fit correctly from the outset. 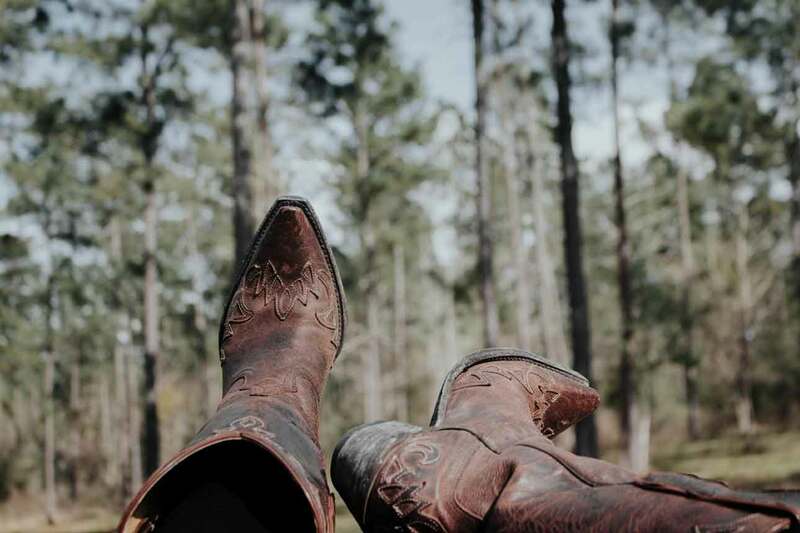 You can read our in-depth fitting and sizing guide for cowboy boots, Hunter boots sizing, and Chelsea boots fit, by clicking the links. In general, for pull-on boots, the same tips apply in respect of socks, insoles, and room for your toes. Again, make sure you shop for boots at the end of the day. You should have to apply a little pressure to push your heel into the boot. If it slips in too easily, your boots will be too big, likewise, if you have to force it in, they could be too small. The instep of the boot should feel snug but not overly tight. If the material allows, try and pinch it at the instep, you should have a small wrinkle but no more. It’s normal to feel a small amount of heel slippage in new pull-on boots. It should, however, only be about a quarter inch. Once the boots are worn in and the soles become more flexible, this slippage should stop. In the same way that it takes a little effort to put the boot on, this should also be the case when you try to take it off. For Chelsea style pull-on boots, the elastic at the opening should be strong enough to snugly but gently cocoon your ankle. Boots made for snow and wet weather or snowboarding boots tend to be a little larger in the foot, to accommodate thick socks and liners. See our guide for sizing and fit for snowboarding boots. 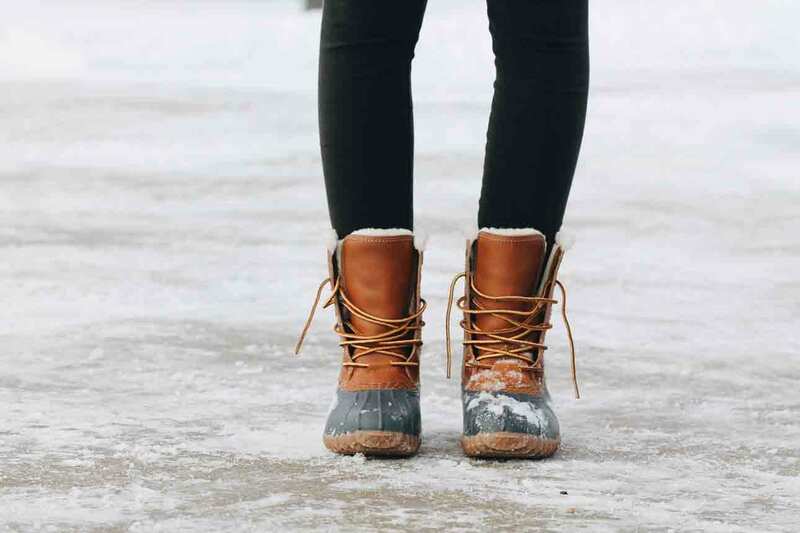 For specific tips and sizes for duck style boots and wet weather boots, such as Sorel boots or L.L.Bean boots, follow the link. When you try the boots on, before lacing up, put your toes on the floor and see how much room there is at the heel of the boot. You should be able to fit one finger in there. Any more, it’s too big, and if one finger doesn’t fit, it’s too small. For longer style boots, make sure you have enough room in the leg to accommodate jeans or pants if you intend to tuck them in. Boots which incorporate safety toe caps tend to be more spacious in the toe area. It’s important with this style of boot to make sure your toes sit in the correct place. 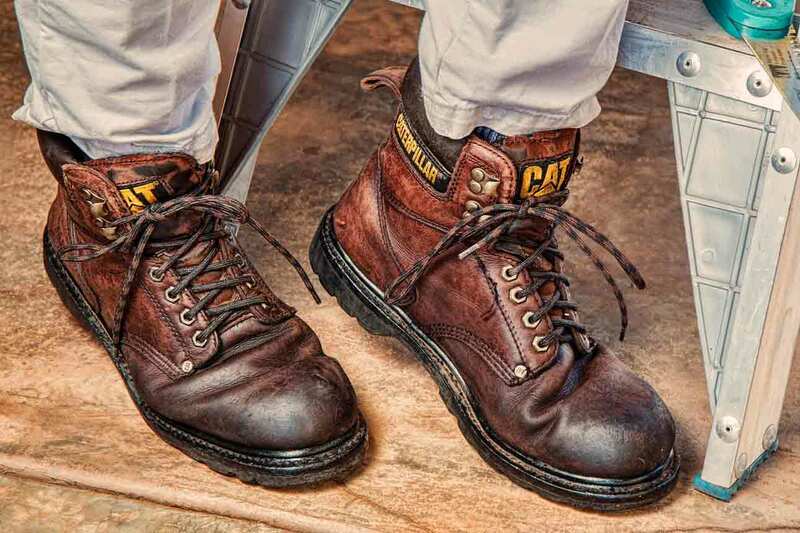 Read our guides for steel toe cap boots like Thorogood or Chippewa, by clicking the links. The ball of your foot should sit at the widest part of the boot, and the base of your toes should sit just behind the end of the toecap. You can check this by squatting down with your toes bent and checking where the boot bends, called the boot flex point. Your toes should not be pinched or hitting the front of the boot. Make sure your toes are not too far back in the boots or the safety toe cap will not protect them against falling objects or other accidents. All manufacturers produce their own sizing guides for footwear. You can find many for different brands in the in-depth guides we have already mentioned. How Do You Know Your Boot Size? To find out which size you need, the first place to start is to measure your feet. A piece of paper, bigger than the length of your foot. The socks you plan to wear with your boots. Put on the socks that you intend to wear with the boots. Sit on a chair and put the paper on the floor in front of you. Place your foot on the paper then, using the pencil, draw the outline of your foot. Make sure your weight is on the foot as you draw around it. Ask someone to draw the outline if you have difficulty with this. Take your foot off the paper and then draw straight lines around your foot shape, using a ruler, so a rectangle is formed. The lines should touch the outline of your foot at the longest and widest points, such as the heel, longest toe, and ball of the foot. Measure the distance between the two longest points of the rectangle. This will give the measurement for the length of your boots. 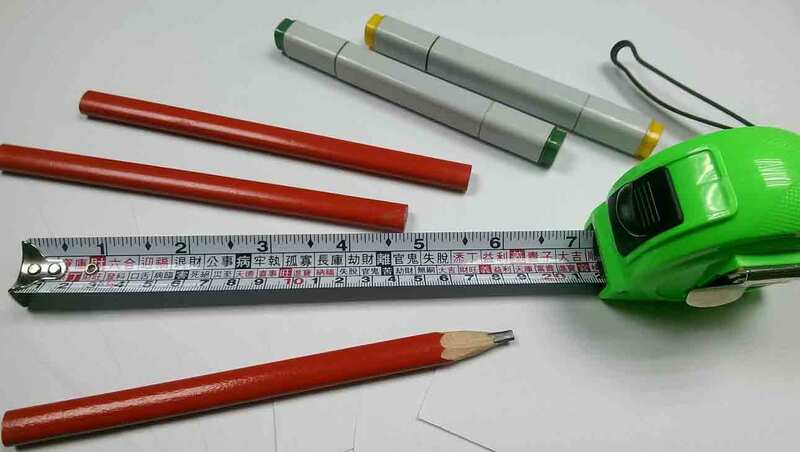 Measure across the widest part of the foot for the width fitting. You can then consult a sizing chart to find out your boot size and width. We have mentioned that feet swell during the day, so measure your feet toward the end of the day. Many people have feet that are two different sizes, so measure both feet and use the dimensions of the larger one. Your feet may be between sizes. If so, then go a half size up. You don’t want boots to be too tight; thicker socks or insoles can be added to compensate. One brand might fit perfectly to your foot size, while others may be bigger or smaller. Even different styles of the same brand can vary. Be sure to check the manufacturer’s sizing chart for the actual boots you are looking to purchase. This video shows a similar method of measuring your feet, using the same materials. Heel slippage is an indication that boots might be too big. This can lead to blisters and cause discomfort. One way to fix this is to wear insoles for boots which are too big. How Much Toe Room in Boots? Your toes should have some wiggle room in your boots. They should not be pinched or squashed against the front of the boots. This will be uncomfortable and can cause ingrown toenails or corns. Boots that are the right fit should feel comfortable from the get-go. They should feel snug but not tight, with room for your toes to move. Dependent on the style, lace-ups should have no heel slip and pull-on just a little. This video from Howcast gives you some tips on fitting shoes, which can also be applied to boots. Should Boots Fit Tight or Loose? They should not be either too loose or too tight. They should fit you just right, a bit like a glove fits a hand. If you are someone who has an in-between size, then use thicker socks or insoles to achieve a snug fit. My Work Boots Have Stretched and Become Loose, What Can I Do? Some boots may stretch with wear and when they do, they become loose. You can compensate for this by choosing the right pair of socks or adding insoles. What Happens If I Wear Boots That Are Too Tight? Wearing tight boots can lead to foot deformities over time. These include things like bunions, hammertoes, and corns. Don’t settle for boots that don’t fit properly for the sake of fashion or personal style preference. There is little doubt that having the right size boots is important for your feet, your comfort, and ultimately your pocket. After all, if your boots don’t fit properly, you’re not going to want to wear them and will end up looking for another pair. Knowing how boots should fit will hopefully mean the next time you invest in some new boots, they will feel like a second skin. You won’t know you have them on your feet, even when you have been wearing them all day. We hope you enjoyed our guide and picked up some useful tips and tricks. Please leave us a comment with your thoughts, and don’t forget to share.